CB Power and Industrial is your representative for Canada, and your industrial equipment experts. 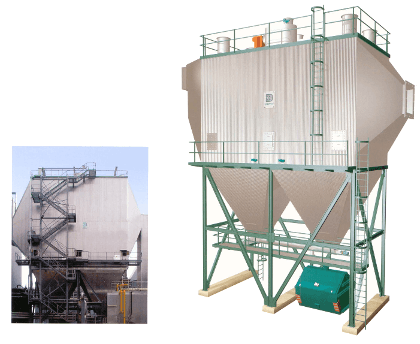 Beth Wet and Dry Electrostatic Precipitators are proven performers on hot gas exhaust projects, as well as newer emerging technologies of biomass combustion (dry ESPs) or biomass gasification (wet ESPs). Recent regulations vary from location to location but as Beth electrostatic precipitators effectively lower dust contents well below 20 mg/m³ this will achieve and surpass even the most stringent regulations. ESPs offer considerable advantages over conventional filtration systems because of their low energy demands, high operational reliability, low maintenance requirements, and competitive investment costs. Beth electrostatic precipitators can operate with or without an upstream cyclone separator. Beth technology can deliver a separation rate of more than 99%. In addition we can offer laboratory pilot plant testing of actual gas streams to determine the optimal configuration for your unique environmental application. Call us at 1-888-317-8959 ext. 26 or fill out the online form for quick answers.